We’ve all been there at one point or another—the second you turn on the car, a little bell chirps and a light on your dashboard flashes telling you that the car’s tire pressure is a bit on the low side. If you get to this stage and feel a little lost with no clue as to what you need to do next, have no fear! 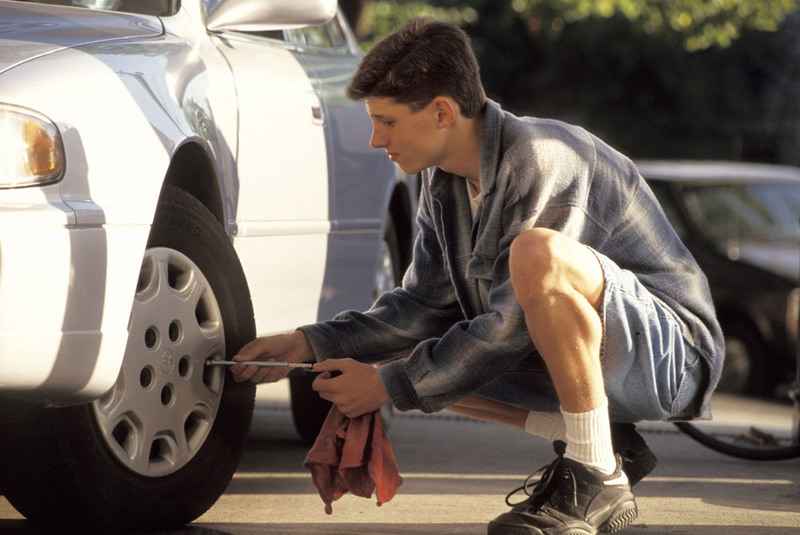 We have exactly what you need: tips on how to fill your tires and check their pressure. Buy your very own tire pressure gauge. Before you take on any task, you have to make sure that you have the right tools—in this case, that means a tire pressure gauge. These handy little gadgets can be found in any auto parts store, such as AutoZone or NAPA, and even at your local grocery store if they happen to have an auto section! Check for the recommended tire pressure. Tire pressure is kind of like Goldilocks finding that perfect bowl of porridge—you want it to be just right for optimal fuel economy. Look in your car’s manual or on the driver side doorpost for the recommended tire pressure of your car. Keeping your tires in this range will prevent any blowouts in the future or early tire wear. Check each tire’s pressure. Keep in mind before doing this to check your tire pressure when they’re cold, since that’s normally when they have the lowest pressure. It usually takes somewhere around half an hour for them to cool down after they’ve been active. Once you know your tires are cool, it’s time to put your new tire pressure gauge to work. Unscrew the valve cap and press the tire gauge into the valve stem (it should look similar to the valve stem on a bike). The number on the gauge is your current tire pressure. Replace your valve cap, write down the number, and repeat on the other three tires. Find an air pump close to you. Whether it’s your own air pump you happen to have handy at home or the air pump at your local gas station, knowing where you will be filling your tires is an important part of the process. Fill your tires. Now it’s time to get down and dirty. We find that it’s easier to remove the valve caps on each tire before filling them up, especially if you’re using a coin-operated machine—it saves you money! Park your car as close to the compressor as possible so it will reach all four tires, and follow similar steps to those you took to check your tire pressure: place the nozzle of the air hose on the open valve and press down while pushing the inflation level. A tire pressure gauge is usually built into the majority of air hoses, so releasing the inflation level can make sure you’re filling up your tire to the proper pressure. Stop when you reach the recommended tire pressure for your car. Adjust the tire pressure. Sometimes, you can go a bit overboard with the inflating. If you happen to have made that simple mistake, go ahead and press down on the needle inside the valve stem for a few seconds—this will allow any excess air to release. Replace your valve caps. The last step is the easiest to forget—don’t forget about those little caps!